This entry was posted on April 28, 2017 by Cole Quinnell. 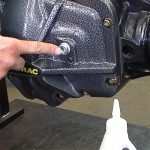 A couple of questions we are frequently asked by customers is how to properly fill their Dynatrac ProRock® axle with gear oil, and which gear oil is best to use. Let’s dive right in! First, we recommend a high-quality GL-5 mineral-based gear oil (not synthetic). In moderate to cold climates, use SAE 85/90. If you live in a hot climate, use SAE 85/140. With the axle installed under the vehicle and the vehicle sitting on level ground, remove both threaded plugs in the differential cover. The large, upper hole is the fill hole, and the small, lower hole is the fluid-level hole. Add oil through the upper hole until it starts to run out of the lower hole. Install both threaded plugs. A typical ProRock 44™ axle will take approximately 2 quarts of oil. The Dynatrac ProRock 60® and ProRock XD60® have a little different fill procedure. Many of these axles have an optional, patented Dynatrac Dual Sump High Volume (DSHV) system that provides additional lubrication to the pinion bearings. This must also be filled with oil when changing the oil in the axle or filling the axle with gear oil for the first time. With the axle installed under the vehicle and the vehicle sitting on level ground, remove both threaded plugs in the differential cover. The large, upper hole is the fill hole, and the small, lower hole is the fluid-level hole. Add oil through the upper hole until it starts to run out of the lower hole. Don’t install the threaded plugs yet. Wait for oil to stop coming out of the lower hole before moving on to the next step. If your ProRock 60® and ProRock XD60® has our DSHV system, there is a small threaded plug in the pinion section of the axle housing. Remove this plug and add gear oil. This fills the DSHV system. Stop adding oil when gear oil begins to come out of the lower hole in the differential cover. Now you can install all three threaded plugs. A typical ProRock 60® or ProRock XD60® front axle will take approximately 2.5-3 quarts of oil, while a ProRock 60® and ProRock XD60® rear axle will take approximately 3-4 quarts of oil. If this is a new axle, not simply changing the oil your existing ProRock® axle, you’ll need to repeat the oil fill procedure after 200-500 miles to make sure the axle has enough oil in it. When using an ARB differential this is extremely important since the oil takes longer to penetrate into the unit. Do NOT overfill the axle! The oil will expand when it gets hot and blow out through the seals. When the axle is new and “breaking-in” it sometimes runs hotter than normal, up to 125C (260F). This may cause some oil to be pushed out through the vent hose at the top of the axle. This should subside as the axle cools and runs at normal temps. Do not be alarmed, but it does make a mess. If you have any additional questions, please contact us at 714-421-4314 or sales@dynatrac.com.